4 October l966 Thai Government complains, through American embassy, that radio signals from American military installations are radiating into nearby Thai communities. Standing: GySgt Frank Alameida (USMC), PO/2 Chuck Combs (USN), PFC John Deering (USMC) behind GYSgt Frank Candelario (USMC), SSgt. Bill Treacy, A2C Mel thasnum behind TSgt Jack davis, A2C Bob Elyard (in shadow) in fron to PFC Mel Snodgrass(USA), A2C George Smith, A2C Gary York (in partial shadow), A2C A2C Bob Jarvis behind A2C Joe Ruggiero (now of H&G TV), A2C Jim Holmes, in front of Bob tuchel, A1C Don Aistrope and A3C David Mellish. Most of this graduating class was sent to Thailand to begin manning the stations that would comprise the new Armed Forces Thailand Network (AFTN). .
3 February l967 Broadcast station at Nakhon Phanom begins operating. 5 February l967 Headquarters, AFTN assumes operational control of affiliate stations. 8 February l967 First AFTN station manager’s conference held at Korat RTAFB. 22 October l967 First shipment of taped electrical transcriptions sent to outlets. 1 December l967 Contracts with Associated Press and United Press International signed for radio and . journal wire services. 5 December l967 Second shipment of taped electrical transcriptions sent to outlets. 10 December l967 AFTN begins Audience Survey at all outlets. 12 December l967 DCA SAM THAI initiates 1000 HZ tone to align all channels associated with the KVH-7 and B-030 circuits. 15 December l967 MACTHAI Public Affairs Office receives AFNB voice line and teletype circuits in their conference. April l968 AFTNA receives verbal notification of 12 enlisted position losses- - effective FY 69. 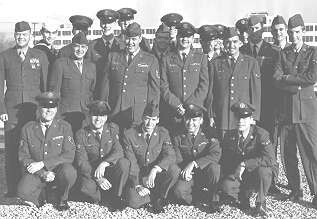 15 July 1968 Interservice Support Agreement, providing for joint service manning, is sent to 13AF (DXI) for approval. 12 December l968 Corrected interservice support agreement, for TV manning, is submitted for approval. 19 December l968 FY70 budget estimate is forwarded for approval. Because of increased TV commitments, budget for fiscal year 70 will be $ 28,000. 20 December l968 First full-duplex operation on teletype circuit R-510 is confirmed with the AFRTS News Bureau in Arlington, Virginia. 25 December l968 AFTN-TV Nakhon Phanom beings program tests with Christmas Day programming. 31 December l968 VOCO approval is received for official sign-on from Royal Thai Government officials, on 3 January l969. 1 Jan l969 The new AFTN manning documents cuts 12 slots, including an admin specialists as TV requirements grow. AFTN receives a request for extension of TV service to isolated Camp Ruam Chi Chai and Camp Change Pradit, which would require microwave relay from Nakon Phanom RTAFB. AFTN requests study of the proposal by the Sacramento Army Depot. 3 Jan l969 AFTN-TV Nakhon Phanom takes the air at 1430 hours. 5 Jan l969 A serious video outage within a TK-22 camera signs the AFTN-NKP television station off at 2200 hours. 6 Jan l969 Procurement begins for Project 96, as microwave systems are requested for Camp Vayama and Hill 272. 9 Jan l969 Replacements found in-country, and AFTN-TV Nakon Phanom resumes broadcasting. Hq AFTN orders an extra camera as “stand-by” to preclude a similar event in the future. 23 Jan l969 Sacramento Army Depot awards the contract for procurement of 616 television receivers for use at all Thailand bases. 31 Jan l969 Joint U.S. Military Advisory Group forwards a request for extension of radio service to its Nong Hahn site. AFTN-News initiates “Conference Calls” on the Network line to provide immediate command ability, while offering news and production material for television and radio. 14 Mar 69 7/13 AF Commander asks the U.S. Ambassador’s assistance in obtaining Thai government approval for FM radio service at Don Muang RTAFB. 19 Mar 69 First 69 television receivers received from Sacramento Army Depot. 27 Mar 69 AFTN-TV Korat signs on at 1500 hrs. 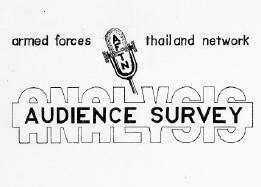 31 Mar 69 AFTN”s Manning Document provides for additional spaces to man TV in Thailand. Mar 69 ABC and Associates Press news film and slide services are contracted. 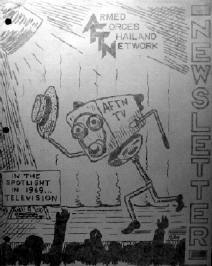 7 Apr 69 Installation and operations are “finalized” at AFTN-TV Ubon, preparatory to a first broadcast. A demonstration for U.S. embassy and Thai officials is offered. 1 Jul 69 Armed Forces Thailand Network changes to American Forces Thailand Network as per directive from AFRTS. 1 Jul 69 Contracts let for AP, UPI wire services and AP Color Slide service for fiscal year l970. 15 July 69 AFTN service is restored to Chiang Mai, using audio distribution system. 16-25 July 69 AFTN radio & TV cover Apollo XI flight with local live broadcasts as well as AFRTS-Washington direct feeds and INTELSTAT pictures direct from the moon. July 69 President Nixon visits, but AFTN reporters are denied permission to cover the event because of “insufficient space”. USIS offers access to their coverage. 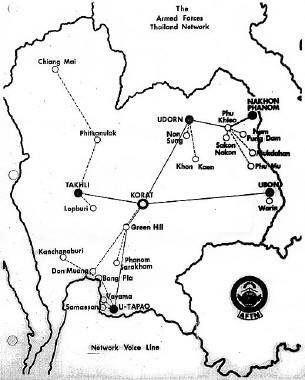 10-14 Aug 69 AFTN carries four important games network-wide during the 1969 Thailand Softball Tournament at Korat RTAFB. 13 Aug 69 DCA/SAM/THAI locates the source of a month-long distortion problem noted on circuit KAR-1. Circuit had been logged out for a total of 72 hours. 18 Aug 69 AFTN loses voice circuit B-030 (AFRTS-W) to a higher priority user. Outage is termed “indefinite”. 27 Aug 69 AFTN’s proposal for network conversion to FM is forwarded to Secretary of the Air Force by Pacific Air Command. 24 Sep 69 Newly-created Network Production Department sends Thailand Orientation Stories to all stations for TV production. Sep 69 Hq AFTN asks several to request a late port call to smooth the transition into a critical manning situation. 15 Oct 69 PCS orders were requested to transfer certain broadcasters around the network. 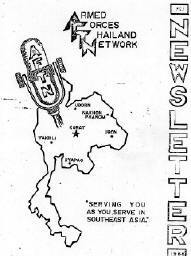 3 Nov 69 AFTN requests reconsideration of the plan to convert AFTN radio transmission to FM. All stations were again reminded of the sensitivity of a broadcast signal radiating off base. 6 Nov 69 First thoughts of an extensive AFTN audience survey were put in memo form by the Network Superintendent. 8 Nov 69 PCS transfer for MSgt Skip Mahnke, AFTN Korat to AFTN Udorn. 12 Nov 69 A list of suggested revisions in AFTN news broadcasting "sensitive" subjects was submitted to 7/13th (DXI) to be forwarded to the U.S. Embassy in Bangkok. 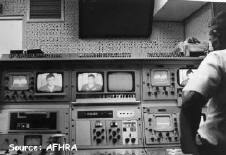 17 Nov 69 The new "Kaleidoscope" format was begun combining news analysis and commentary from AFRTS-Washington voice line with contemporary music on the hourly week-day network radio program. 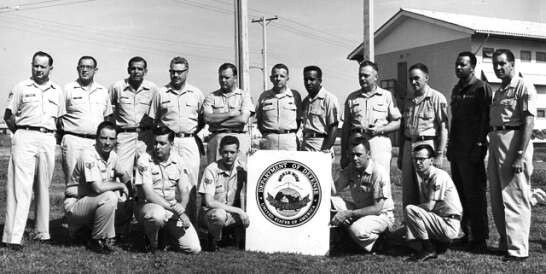 18 Nov 69 Temporary manning assistance was requested from 13 AF to alleviate a critical problem caused by a lack of an engineer at AFTN Udorn. 3 Dec 69 Complete request and justification for an AFTN squadron designation was submitted to 7/13AF (DXI). 4 Dec 69 Permission on to conduct a test on FM feasibility was received from 7/13AF. 9-11 Dec 69 AFTN Station Manager's Conference was held at AFTN-Korat. 23 Dec 69 AFTN asks American Forces Vietnam Network for a loan of a "7800" Video Tape recorder to be used at AFTN-Udorn. 24 Dec 69 Preliminary test of FM transmission were completed and forwarded to 7/13 AF (DXI). 29 Dec 69 AFTN asks AFRTS-LA for an FM stereo program package for test purposes. 30 Dec 69 Network supply asks all stations to identify the location of TV sets signed out on AF Form on 1297.